Unwanted from the moment she’s born, Sunny is determined to escape her life in rural China and forge a new identity in the city. As nai?ve as she is ambitious, Sunny views her new job in a grueling factory as a stepping stone to untold opportunities. When fate casts her as a company spokeswoman at a sham PR event, Sunny’s bright outlook starts to unravel in a series of harrowing and darkly comic events, as she begins to question a system enriching itself by destroying its own people. Frances Ya-Chu Cowhig is an internationally produced playwright whose work has been staged at the Royal Shakespeare Company, the National Theatre of Great Britain, Manhattan Theater Club, the Goodman Theatre, Trafalgar Studios 2 on the West End and the József Katona Theater in Budapest. In 2018 her most recent work, Snow in Midsummer, a contemporary adaptation of the Yuan play by Guan Hanqing, will receive its North American premiere at the Oregon Shakespeare Festival, in a production directed by Justin Audibert. Frances' plays have been awarded the Wasserstein Prize, the Yale Drama Series Award (selected by David Hare), an Edinburgh Fringe First Award, the David A. Callichio Award and the Keene Prize for Literature. She has held year-long playwright residencies at Manhattan Theater Club and Marin Theater Company, and is currently under commission from South Coast Rep, the Goodman Theatre and the National Theatre. She has benefited from artist residencies at Yaddo, Macdowell, Hedgebrook, Ragdale, the Sundance Playwright Retreats at Ucross and Flying Point, and the Santa Fe Art Institute. Her work has been published by Yale University Press, Glimmer Train, Methuen Drama, Samuel French and Dramatists Play Service. Frances was born in Philadelphia, and raised in Northern Virginia, Okinawa, Taipei and Beijing. She received an MFA in Writing from the James A. Michener Center for Writers at UT Austin, a BA in Sociology from Brown University, and a certificate in Ensemble-Based Physical Theatre from the Dell’Arte International School of Physical Theatre. She is currently a member of the Theater and Dance faculty at UC Santa Barbara, where she has the pleasure of mentoring undergraduate playwrights and directing the Dramatic Writing Concentration. 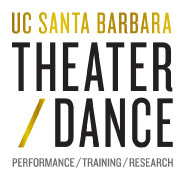 Visiting Associate Professor, Daniel comes to UCSB after seven years at Brown University as Head of Physical Theatre. Prior to that, he spent over a decade at Dell’Arte International in Blue Lake, CA. serving as School Director and core instructor. After studying in the Professional Actors Training Program at Carnegie-Mellon University, Daniel went to Paris, France to study with Etienne Decroux, becoming M. Decroux’s frequent translator. Subsequently making his home in Paris for 20 years, Daniel started his professional career as an actor with the French National Theatre. His solo performances have toured in more than 30 countries, as well as in theatres such as the Kennedy Center and Lincoln Center here in the United States. He has taught master classes throughout the world at institutions such as Juilliard School of Drama and The Shanghai Theatre Academy. Daniel has received grants from the National Endowment for the Arts, the United States/Japan Commission, the Pew Charitable Trust, and is a John Simon Guggenheim Fellow. The 2016 summer saw him in Seoul, South Korea devising an original piece with 18 Korean actors from “Flying Off the Cliff” Theatre Co. (http://clifftheater.com) and teaching Generating New Performance Material and Creativity. The World of Extreme Happiness by Frances Ya-Chu Cowhig is his first main stage production at UCSB. He is thrilled to be part of this wonderful UCSB BFA Acting program. Under Special Thanks: Paul Frasco for the origami birds, Irwin Apple, Risa Brainin, Michael Morgan, Ailish Riggs, Patrick Lindley, Sally Stein, Carlos Morton and Annie Torsiglieri. This fearless, satirical, and humorous story, with its themes of the one-child policy and the hopelessness of poverty, continues to fascinate the audience with its untold opportunities.